Amid a big fanfare the night before the 2007 Auto Shanghai show, Audi invited journalists from all over the world to witness the unveiling of the Cross Coupe quattro concept. Strictly speaking, the new vehicle is not a sports car, a 4-door sedan, or a sport ute. It is in fact all of these. According to the folks at Ingolstadt, the Cross Coupe quattro concept combines the sportiness of a sports car, the functionality of an SUV and the stylishness of a coupe incorporating four doors. With 172.4 in. in overall length, on a 102.4 in. wheelbase and 71.7 in. in width, the Cross Coupe is slightly larger than the Audi A3 Sportback. Up front, the familiar Audi-signature single-frame grille is flanked by two narrow and slanted LED headlights. The windshield rises sharply, followed by a roofline that slopes downward and finishes at the rear via a thick D-pillar design. The shoulderline, which rises gradually from front to back, gives the car a sporty, 2-door coupelike feel. Inside the Cross Coupe, a pale, off-white color scheme on the instrument panel and center console contrasts with the rich, leather-wrapped seats. Audi's MMI multimedia display sits above a perforated trim piece that houses 4600 holes for ventilation. New technology includes the ability to laser-project incoming text messages and phone calls onto the windscreen. The Audi Cross Coupe quattro comes with an all-wheel-drive system put to use by front MacPherson-strut and rear 4-link independent suspension. Steering is actuated via an electromechanical system. The shocks are magnetic-controlled to vary ride quality according to different road conditions. Ceramic brake rotors not only can last for 186,000 miles, but also are 44 lb. lighter at each corner, helping to lower the car's overall unsprung weight for better handling dynamics. Powering the new Audi is an all-new, 204-bhp 2.0-liter 4-cylinder TDI diesel engine mated to the impressive direct-shift gearbox (DSG). 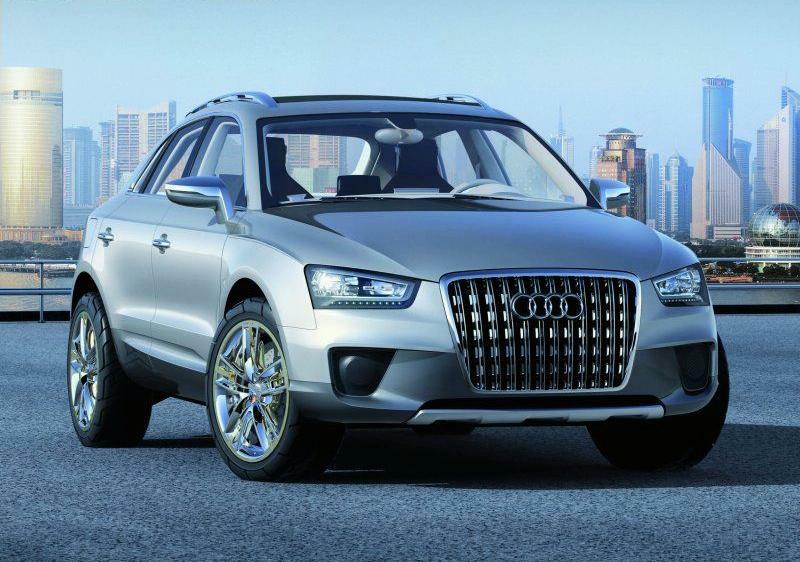 For being a concept vehicle, the Audi Cross Coupe quattro is surprisingly well-developed. With BMW entering the small sport ute market with the X3, and Land Rover with the LR3, Audi is throwing its keys into the ring, but with a slight twist. By combining a sports car with a sport ute, Audi hopes to differentiate itself from the rest of the pack.